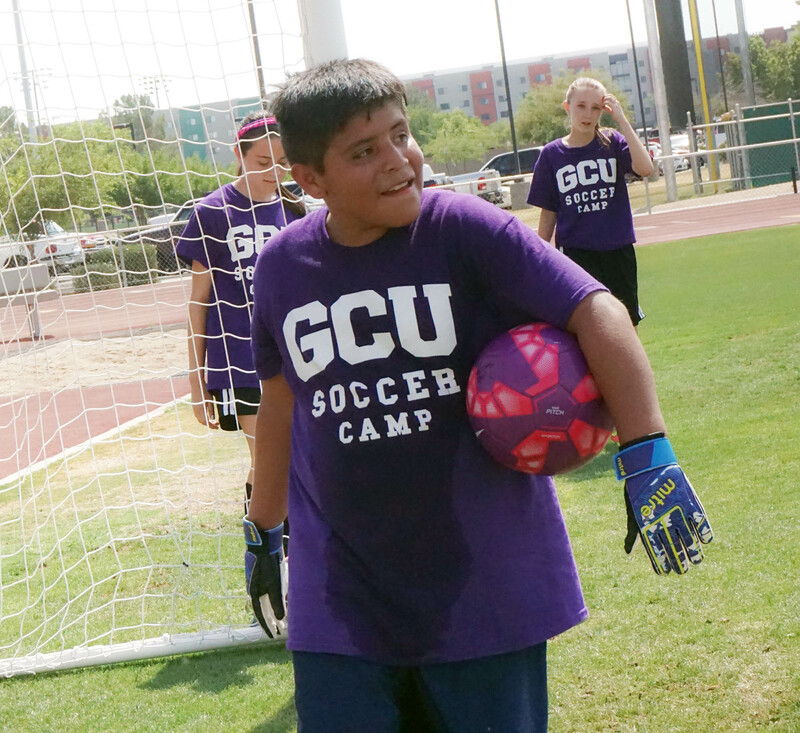 Four children in foster care got to experience a lot of happiness and sunshine when they received fully paid scholarships to attend the GCU Goalkeeper Camp, hosted by GCU men’s soccer coach Schellas Hyndman. 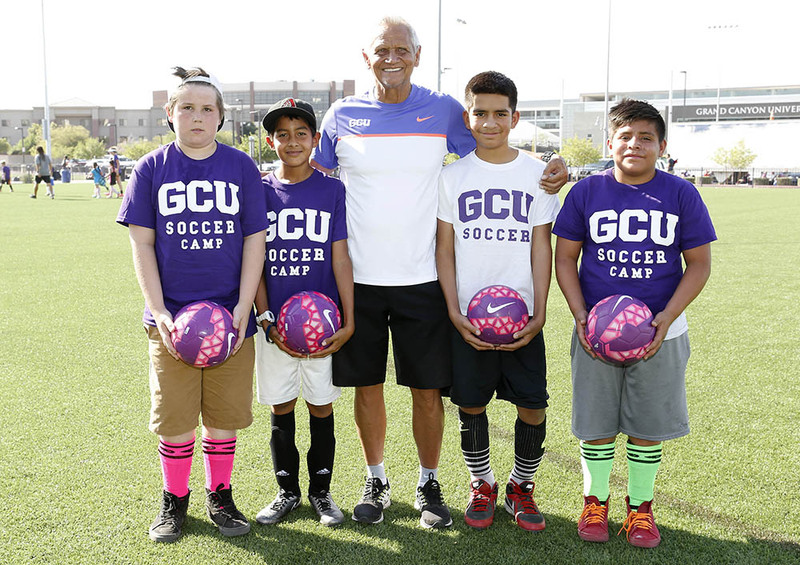 Four tweens got the opportunity to be part of Grand Canyon University’s soccer camp after being awarded a scholarship on behalf of men’s soccer coach Schellas Hyndman (center). They were (from left) Devon Connelly, Bryan Martinez, Fernando Ibarra and Joshua Layton. 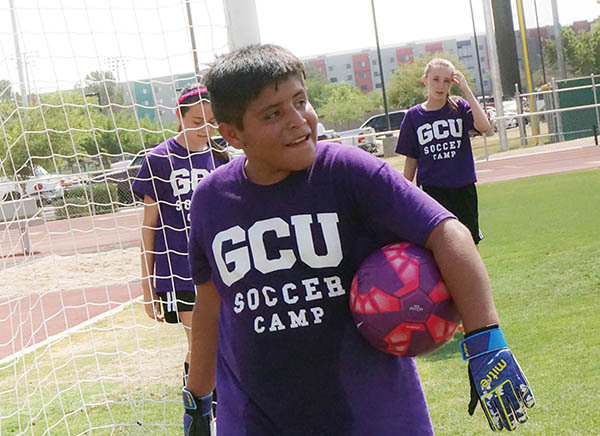 The four foster children-turned-budding soccer stars thanks to a GCU Goalkeeper Camp scholarship got more than they thought possible. It was more than just a new soccer ball for continuing practice, and more than just new friends, but something more important: They experienced the chance to be a kid again. For instance, Joshua Layton, who felt insecure running with his teammates, found a unique thrill as goalkeeper after GCU men’s soccer coach Schellas Hyndman encouraged him to give it a try. In the new role, he hurled himself across the goal, leapt high in the air to catch balls and shouted at his teammates. He owned it. Fernando Ibarra, who at first was too timid to reach out to new friends, grew out of his shy shell. During his final game, he patted his teammate on the back after making a good pass and Hyndman watched proudly. Bryan Martinez, who never imagined he’d get to play on a team, was all smiles even behind the drops of sweat. “It’s been fun,” he said, showing off his new tricks. 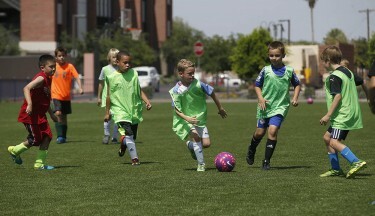 But he admitted he needed a lot more practice to be as quick as his favorite soccer player, Neymar. Though there are many reasons why a child may be placed in foster care, a large number of cases are due to neglect and abuse, according to Rain Hernandez, outreach coordinator at Arizonans for Children. Currently, the tweens live in local group homes with a handful of other kids. Will they miss the camp? Joshua Layton “owned” the goalie spot. 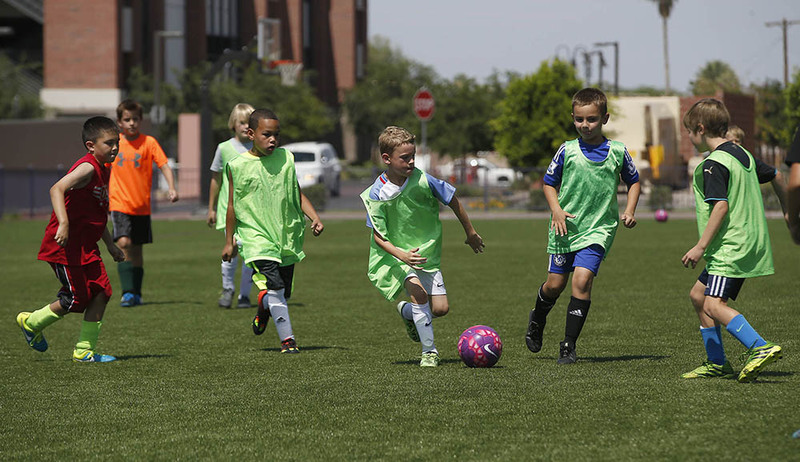 One of the many key components of the camp is the joy that surrounds it – from the coaches, to the staff, parents and families, said Ben Paneccacio a second-year GCU assistant coach, and one of the loudest on the field. GCU assistant coach Brent Erwin said while everyone got better at soccer, these four kids got better as kids. In fact, three of them tried to “meg” him. “It was great,” he said. Last week, after the Phoenix Foster Festival, the four athletes were given the opportunity to experience the GCU Goalkeeper Camp. The application process included a 100-word essay scored on four categories: appreciation for the opportunity to attend camp, an interest in soccer, personal knowledge and experience in soccer, and character. Initially, Hyndman had only two scholarships to award, but in the end he said he felt touched by their eagerness and dedication. In one entry that stood out most to him, one of the tweens even shared that he was born in Guatemala and had a twin brother he hadn’t met since he was adopted when he was 10 months old. Debbie Accomazzo, the University’s community outreach manager, also took part in the selection process, but she was not surprised by Hyndman’s final decision. Hernandez saw how much the opportunity meant for one tween when he ran up to her with open arms before practice.